Dental Implants in Grand Junction, CO | Grand Dental P.C. Unlike dentures that restrict your diet, dental implants let you eat whatever you want. Your gums can finally rest because the crown or denture is supported by the implants. Smile, laugh and speak with confidence without worrying that your teeth will come off. Unlike dentures, dental implants stimulate the bone and prevent bone loss. Dental implants are the closest things to the real deal. No need to use messy adhesives that don’t work. Dental implants are becoming more popular as an alternative to dentures and bridges. Unlike dentures, dental implants look, feel and function just like real teeth because the dental implant is surgically embedded into your jawbone. The titanium screw serves as a solid foundation for dental crowns or complete dentures. For the most natural look, each custom crown we make is matched to the size, shape, and color of your original tooth. The procedure depends on the type of dental implant used, how many teeth you’re replacing and your general health. Full-sized implant placement requires the patient to be in good overall health and have good jawbone volume and quality. If the bone is too thin at the implant site, bone grafting is necessary to strengthen the area and allow the titanium screw to fuse with bone. Mini dental implants can be placed even if the patient has an extensive bone loss. Some of the small-diameter implants are placed at an angle to provide maximum support for the crown or denture. Are You or Someone You Know Missing Teeth? Dental implants are a terrific long-term solution for restoring the function and appearance of natural teeth. 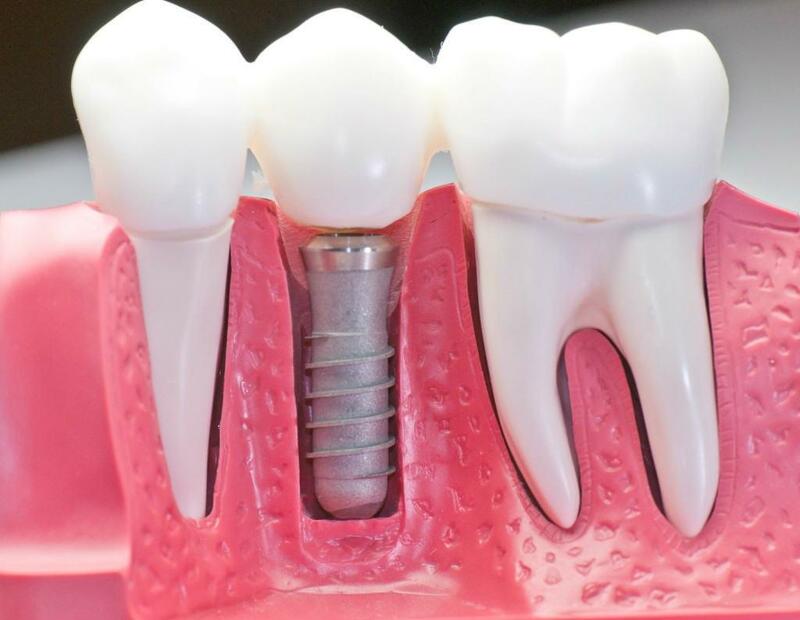 Dental implants combine an artificial tooth root, made of titanium, with an engineered dental crown. Dental implants look like your natural teeth. The dental crown is custom-made to resemble your other teeth. Your dentist, Dr. Eric Benefield of Grand Dental, P.C., will match the crown to the original size, shape, color, and fit of your original tooth. With the solid foundation of a dental implant, you will be able to eat the foods you enjoy without discomfort or pain. Your bone easily fuses with the titanium implant creating a strong anchor for your new teeth. This returns all the biting and chewing power you had previously. Dental implants help you maintain overall better oral health. It’s not necessary to remove or modify the surrounding healthy teeth around the gap of the missing tooth. The dental implant helps maintain bone in the affected area of your mouth. Without your natural tooth or dental implant, the bone slowly deteriorates leaving a indentation between your remaining teeth. Do you know you need dental work but are anxious or fearful about the dental visit? Sedation dentistry eliminates these feelings allowing you to receive the dental care you need. At Grand Dental, we care about your comfort and dental health. With sedation dentistry, you can relax through your appointment. We can get more dental work completed in fewer visits which will also save you time and money. The smile you want is now affordable. With multiple financing options, you don’t have to suffer with your current dental condition. Call today 970-243-8580 to learn the financing options you can use to take advantage of our services. Our outstanding dental team will answer your questions and get your appointment scheduled to improve your smile. We are here to help you get the excellent dental care you need. We accept multiple financing options including all major credit cards, CareCredit®, ChaseHealthAdvance℠, and more. Regardless of your insurance situation, these financing options can help you get the dental work you need without creating a financial burden. Your Colorado dentist provides sedation dentistry for anxious or fearful patients undergoing implant surgery. Sedation is also recommended if you are having multiple dental implants placed. Call 970-243-8580 today to learn more. You can also click here to make an appointment. Visit our dental office today! Dr. Eric Benefield and the rest of our team are here to help you get the excellent dental care you need.